If you are a Google Apps school - and even if you're not - Chrome offers some very helpful features. Most importantly is that you can sign into Chrome and have the same experience on any device (home, school, tablet, mobile). All your docs, preferences, apps, extensions, backgrounds, and more sync via the cloud. Just don't forget to sign out if you're on a public or shared computer. Using Chrome with Google Apps for Education provides even more power. Administrators can control the start pages, preferences, automatically enforce SafeSearch, load specific extensions & apps, and push updates out automatically. • Works on most any device or computer, regardless of operating system. • Tabs opened on one device can be accessed on another when you are signed into your account. • Search directly from the address bar, no need to go to Google first. Stopwatch - A very precise stopwatch that allows you to save your splits. • Apps are similar to those on phones or tablets and can be installed via the Chrome Store. • Extensions usually work in tandem with a webpage. They can be used to generate urls, bookmark items, show reminders, or perform some function on a specific webpage. Also installed from the Chrome Store. 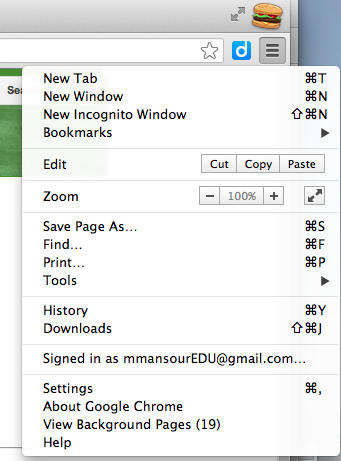 The Incognito Window (accessible by the button) opens a new browser window in Chrome. Pages you visit from this window are not kept in your browser history and all cookies are cleared when you close the window. While adults and students often use this to keep their (sometimes inappropriate) viewing history private, it has a number of other utilities. • Using the Incognito window, a Chromebook user can log into multiple google accounts without signing out of their main account. • Check out a website you make from the user's viewpoint. The Incognito window will help you see what it looks like to outside users since it won't be logged into your accounts. • Sometimes I need an extra machine in my room, so I have a student use my personal computer. I don't want to load their accounts onto my Chrome list, so I have them use an Incognito window and they can log into their accounts quickly.